Tennant’s creative activities and scholarly work has been focused on designing contemporary fine art furniture, sculpture and the exploration of material and process. Over the span of Tennant’s career, he has developed a rich vocabulary of forms and techniques that beautifully unite balance, structure and expression into his work. Each piece incorporates variation, improvements and a continuous desire to “try something different”. Tennant has been a practicing sculptor and furniture maker since graduating from Alfred University in 1972. He worked as a studio assistant for international renowned furniture designer Wendell Castle before joining Indiana University’s Herron School of Art and Design IUPUI. 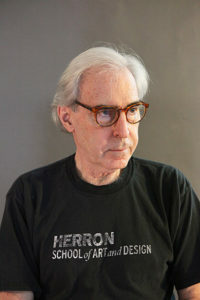 Tennant established and chaired the Herron Furniture Design Department until his retirement in 2013. He has exhibited in art galleries, universities and museums nationally and has been featured in publications such as Fine Woodworking, American Craft Magazine, Studio Furniture and many more. He has conducted many workshops as a visiting artist and has been awarded numerous private and public commissions. Tennant leaves an important and lasting legacy through his teaching. Graduates from Herron’s Furniture Design Department can be found coast-to-coast, working in the furniture design industry, teaching at universities, exhibiting in galleries and continuing to advance the studio furniture field. Making my work is a lot like a dog chasing its tail. What I’m after is that “perfect form”, but it remains tantalizingly just out of reach. The whirling and twirling sure does keep me occupied and at times a bit disoriented. If I can spin a bit faster, I might just catch a taste of the “tail” always remembering that it is the journey that matters.